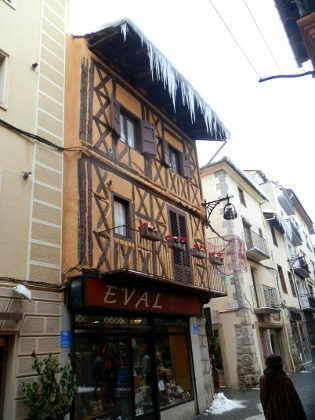 Puigcerda is the main Catalan town in the Pyrenees, on the border with France practically joined to Bourg Madame on the French side of the border. Being February, the Pyrenees are covered with snow with conditions perfect for skiing, so we caught the train to Puigcerda from Vic, and while the children got off for the slopes of La Molina and Masella, we stayed on the train for an explore of the snowy Puigcerda. 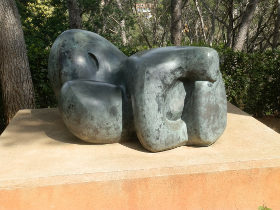 in fact, one of the joys of the Costa Brava is the variety of landscapes and locations in such a small area and the ease of making connections. Seven days ago we were exploring a new bay at the coast in Blanes, then we went cross-country for a volcano near Girona, and then the day after we're in the snow and mountains mixing with skiers and snowboarders. Our journey did start early however, as we wanted to connect to the Barcelona train at Vic and to give the children a full day, so we left at 6.15 and headed past Montseny on the C21 for the train at Vic at 08.16. We took the train because our car isn't really set up for winter driving, so we didn't want to drive up into the mountains themselves for the risk of getting caught in the snow. And secondly, because there are combination train and ski tickets that include a ski-pass with the rail-ticket. And thirdly, just for the train ride into the snowy mountains. In fact, this combination ticket (Ski-Tren) is available from all stations out of Barcelona, as the train we were catching comes from BCN Sants, through Granollers, then up to Vic, to Ribes de Freser where is connects to Val de Nuria, or on to the much larger ski area around La Molina. In practice, our journey from the Costa Brava to Vic took around 90 minutes, so we could have left a little later - even though we didn't hurry, it's a fast route. There weren't too many people catching the train from Vic itself, and we did have other options - for instance to join it later at Manlleu or further up to Ripoll, but for the trade-off of driving over train Vic seemed a good compromise. The train itself is slow and steady. It definitely doesn't feel express. Journey time should have taken about 90 minutes to La Molina, and then another 20 minutes on to Puigcerda, but we had a 30 minute delay in Planoles as we had to wait for another train to come down. The delay in Planoles was fun though, as the station was full of snow (about 60-70cm) and they opened the doors so children on the train could go out to play and South American tourists went out to take selfies. The journey does feel like it goes slowly though, but you have the joy of climbing up into the snow, so that from Ripoll we had a rough covering of the ground. Then by Ribes de Freser depths were more like 10-20cm, until La Molina where passengers were warned about the depth of the snow as there was about 60-80cm on the platform with cars with quiffs of snow on their roofs. The reason for the slow journey is that the route is single track so the trains coming down can only pass those going up at specific stations. The single track route then passing through narrow tunnels or along narrow embankments about the valley. Having let the children off at La Molina (they were heading back to Barcelona to stay over at the end of the day - last trains back at either 17.17, 17.57 or 19.24), we continued on to Puigcerda, the capital of Cerdanya. The train comes out of the mountains, down past Alp, and then onto the plain. 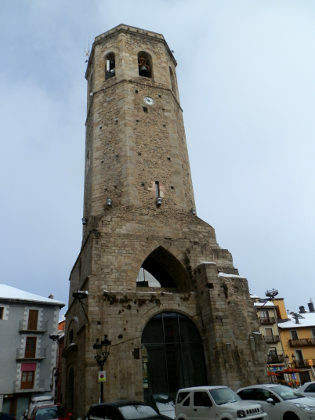 Cerdanya has a large plain that is surrounded by mountains, and in the distance Puigcerda sits on a hill that rises above the plain. The landscape was all covered snow, with horses in the fields seeking shelter in the hay stalls, or standing looking cold in the fields. 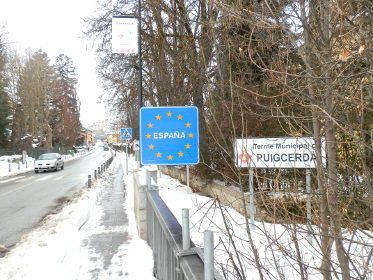 The station in Puigcerda is at the level of the plain and to get into the town means a climb. After jumping in the snow for fun, the first thing we noticed was the huge icicles on the buildings. Naturally, this is all chilly weather, so we were prepared with proper boots, gloves, scarfs and winter clothes. It would be easy to forget this is proper winter weather if you've come from a mild warm coast. However, the roads and steps up were clear of snow and it was relatively easy to walk up into town, and in places there are lifts/elevators too. The town has a criss-cross of streets with a good selection of shops as it's the main shopping centre for the area. The position on the hill gives great views and we could see the chair lifts back at the ski resorts on the mountains opposite in the distance. 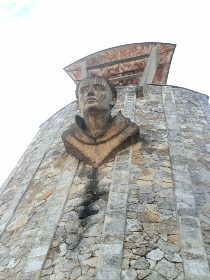 The main monument in the town is a church tower in one of the squares, where only the tower remains, the remaining building seems to have been destroyed. A second church also exists and stalls were out for a market with produce from the area. We explored around the edge of the town and found the lake and park. The lake was completely frozen apart from a small patch which was full of ducks, geese and swans. 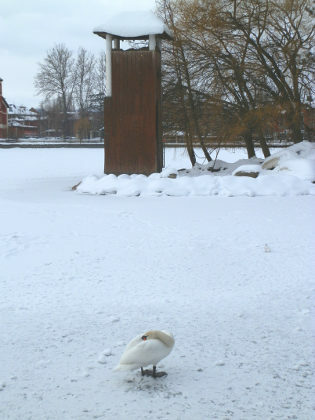 The ice was covered with snow, but it was strictly no going on the ice. From the park we headed to France. We actually tried to follow the roadsigns and found ourselves having to walk on the road as the snow was too deep on the footpath, so this wasn't too nice, but eventually we found the crossing point. You see the customs point first, then walk along the road and over the bridge and suddenly you're in France and Bourg-Madame. The language changes, the signs change and that quickly, you're in somewhere that feels like a different country, with the oddity of seeing a cafe selling huitres (oysters), a dish that is classic in Roussillion but that we never see in Spain. Bourg-Madame is not large but has a supermarket and a small collection of shops (closed on a Sunday). It also has a station for the Little Yellow Train (Train Jaune) that links down to Perpignan on the French side. 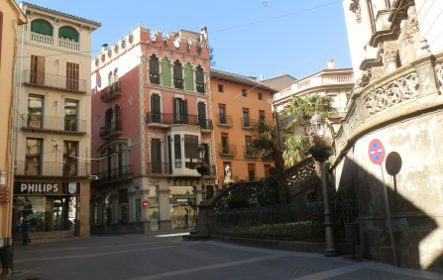 In fact, the train to Puigcerda continues to La Tour Carol (La Torre de Querol in Catalan) which is also the end point for the Little Yellow Train. We went to the station, but there weren't many connections for winter - the train is quite a tourist attraction in the summer. Returning to the town we took a coffee in one of the many cafes and just browsed around the shops. 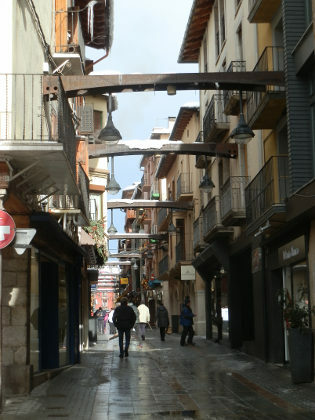 For those who come up for skiing, Puigcerda can be a good base as it feels quite lively. The one time we stayed in La Molina (in summer and a while ago admittedly), it felt like it lacked a few amenities that you might expect for a mountain village, though this could have improved by now. And then the train back. We didn't wait for the ski train, but came back mid afternoon, nonetheless it still was getting quite busy. The area around Girona, particularly La Garrotxa and Olot, is famous for extinct volcanoes and these extend south from Girona too, around the airport. In fact, if you're in Girona airport and look out to the surrounding countryside, you'd easily spot the classic tall, flat-topped mountains that in former times (millions of years ago), would have been active volcanoes. 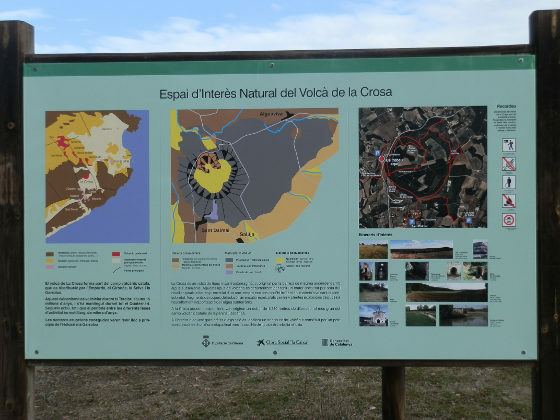 The largest extinct volcano on the Spanish mainland is the Volca de la Crosa which is just a few kilometres from the airport itself between the villages of Aiguaviva, Salitja and Sant Dalmai. However, this isn't one you'd see easily, as the walls of the old caldera are relatively low rising no more than 30-40m above the plain with woods now on the sides. Since we currently have to make regular weekend trips to Caldes de Malavella to pick up and drop off for the train to Barcelona, we spotted the green star marking a place of special interest that we thought we'd explore. Of course Caldes de Malavella itself is town with hot springs, and former Roman baths, and it too has a hidden volcano out at the Camp del Ninots. Early February is also the most likely time in the year for snow to come down to the lower hills and mountains. As the temperatures drop, the lower the snow comes. If the conditions are right it can even come down to sea level, and we've had a short flurry in the air one day this month. 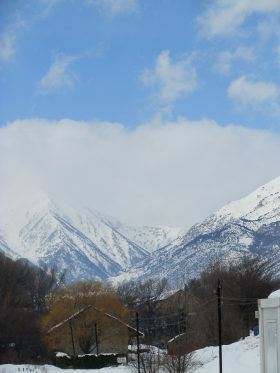 However, for the most part the snow stays higher than 600-800m meaning only the higher hills and mountains turn white. Nevertheless, this is still sufficiently low for the upper parts of Montseny to have snow. In fact Montseny rises to about 1500m, and can be seen in its snowy-dress from the beach in Barcelona on a clear day, and while we're used to seeing a white Canigou on the Pyrenees in the distance, seeing Montseny with snow is quite magical because it's much closer. So having done the train drop, we continued out past the airport and then across to Aiguaviva with a white-coated Montseny in the near distance, and down to the large parking area that sits just outside the volcano itself, with views to Brunyola and Montseny beyond. The day itself was clear, as the Tramuntana wind had blown away the dust, and with a bit of sun was still 10-11C, so perfectly good walking weather. The Crosa itself has well marked tracks and lots of useful signposts to explain the history and generation of the volcano. The caldera itself is around 1250m in diameter - so more than a kilometre around, but once you add the rim and walk across the centre, and then out to the villages, our walk took more like 2 to 2.30 hours - around 8-9km. However, since the rim is relatively low, and the centre of the old volcano is now flat meadow lands with orchards of walnut trees, it doesn't have spectacular pictures as you might expect from a volcano. Instead it makes a pleasant walk. In practice we meandered around the paths, and this is as good a way to explore as anything, so there's no set route as such. From the parking we followed the rim to the east, before following the path into the volcano centre. From here we walked across the centre in want is now flat fields and small walnut groves, before climbing the rim almost where we started. From here we went south along the rim top through the woods, before heading to Sant Dalmai. Sant Dalmai is a small farming village with a small church, but not so much else of interest. We then linked to the next village of Salitja before turning back to the volcano at the Ermitage of the Fonts. The Ermitage has a small natural spring next to a low chapel, though the water is untreated and not for human consumption. From the chapel, we returned to the rim top of the volcano and completed the circuit via the eastern side. If you follow the GR92 walk from Blanes to Tossa de Mar, a fair bit of the walk is away from the coast along the hills above the sea. 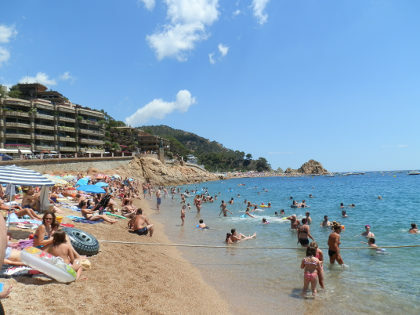 This is because there are two stretches of coast that can't be connected by paths directly - Santa Cristina beach, closer to Lloret, and Cala de Sant Francesc closer to Blanes (and between the two is are the Botanical Gardens of Pinya Rosa). We'd not actually visited Sant Francesc, but Blanes council said they had done up some of the GR92 walking and we had to visit Tossa de Mar, so on a wet January weekend we went to explore, partly to add it to our list of Costa Brava beaches. 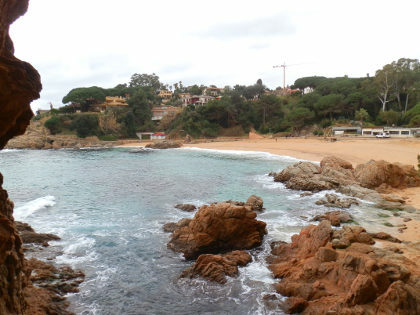 As an orientation, Cala de Sant Fransesc sits below the Castell/Tower of Sant Joan that stands above Blanes and is on the other side of the hill from the town itself. Blanes has the benefit of being on the train-line to Barcelona, but to get to the bay walking from Blanes requires walking up hill out of town, and it's a good couple of kilometres from town, so realistically is more accessible by car (though I guess in summer the parking would be difficult). If you drive past you'll see one of the access roads is blocked as marking a private estate, however, there is a second road that will take you down to the bay. We parked at the top and simply followed the road down from the top to the beach, explored a little, then navigated back up via the series of connecting stairways that provide short cuts up the zig-zagging roads. This is very much villa country with the hillside filled with mature and attractive coastal properties looking out to sea. These surround a private tennis and sporting facility that looks very well maintained and cared for and it feels quite luxurious, without some of the industrial feel that Blanes itself has. At the bottom is a very pleasant beach, with gritty yellow sand of a type similar to that found in Lloret with a bar and restaurant at the back. To the left and the right are walks around the bay, and it looks as if these were the areas recently improved with new wooden rails. We did try the routes to both to the right and left. The one to the right takes you up close to a tall island that you don't realise is an island until you walk past, as the channel is so narrow. This ended in a doorway marked private in Spanish and Russian. The door was open, but we didn't go any further. Instead, we returned to the beach and tried the lefthand walk. This again was newly done, but came to a stop at a large iron gate. The path and the same wooden rails continued on the opposite side of the gate, so it is possible that this might be open at a different time of the year. However, for us it meant that there was no way out of the bay except back up the hill. As a beach, it's very pretty and we may return in the summer to test the water for swimming. 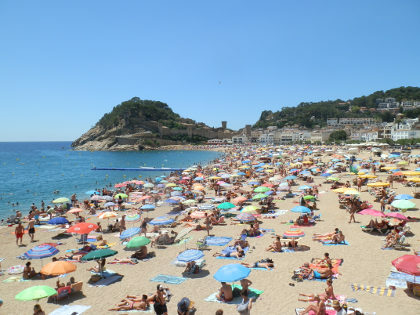 And if you are in Blanes it would provide an alternative to the town main beach. 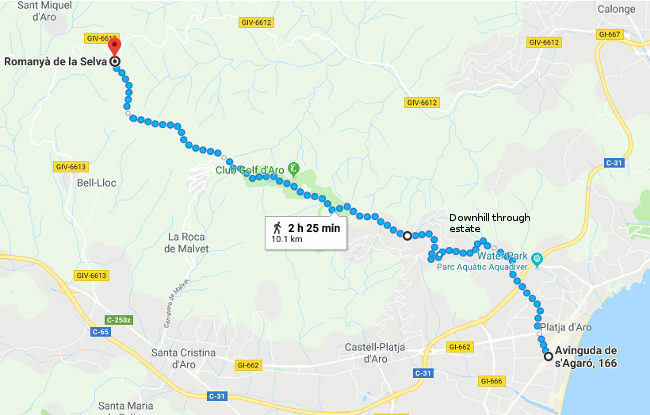 Update March 18: Diari de Girona is just reporting that the stretch of path after the gate has been opened and should allow continuation towards Lloret. We'll revisit during summer to see. 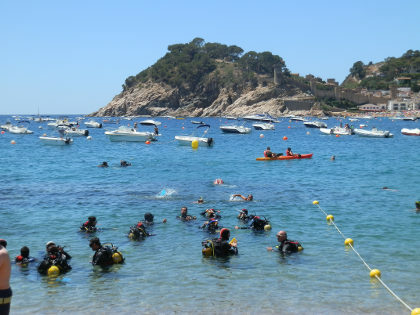 We just headed to Llafranc for leisurely stroll and coffee, only to find the village was filled with swimmers for the Calella de Palafrugell to Llafranc 7km swim via the Isles Formigues. Out to sea there were hundreds of swimmers making their way into shore shepherded in by support boats and canoes. The Radikal Swim website who organise the event says that there are a range of swimming events taking place over this weekend (14/15 October) for all ages and abilities with the 7km event being the longest. 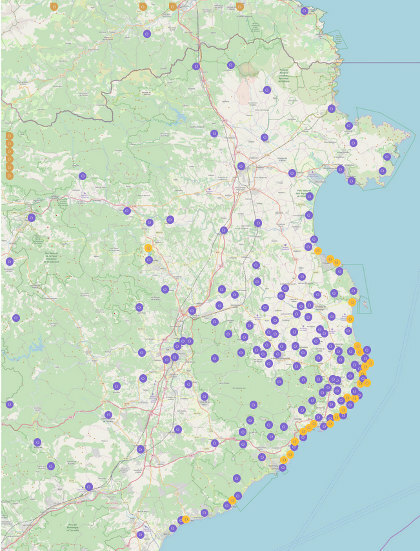 As we've mentioned before there are a number of long distance (2km+) swimming routes in the Costa Brava now between beaches and around headlands (Via Braves). For more sporty visitors and triathletes, this gives an additional more competitive option to enjoy the waters here. Now we have the date, I'll take a camera next year, or maybe take part, depending on how fit I feel. 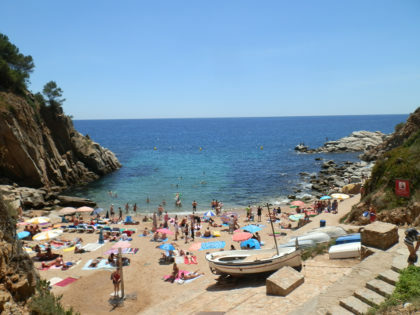 For swimming nearby see our Swimming and Beach series: Swimming and beach at Llafranc - Swimming at the beaches of Calella de Palafrugell - Swimming at the beach at Tamariu - Where are the best beaches on the Costa Brava? Yesterday, October 3rd 2017, was a general strike in Catalonia against violence seen during the Catalan Referendum on Sunday 1st October. 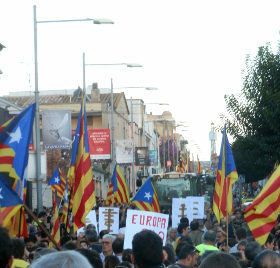 As part of the general strike, towns and cities throughout Catalonia came out onto the streets to demonstrate support in the evening. 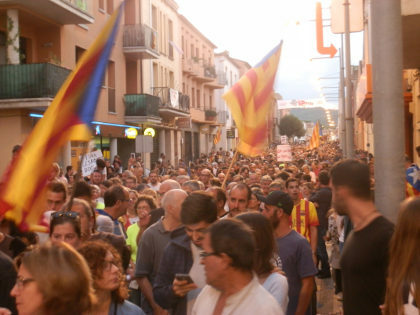 We went down to attend the local march in Palafrugell and to give a sense of the demonstrations and the strong desire for political change in Catalonia. At this point I'm going to try to give a potted history and explanation of where and why Catalonia believes it should be independent and some background to what's going on. It's fair to say that for people from outside the region, it can be difficult to understand what is going on, and why there is such a depth of feeling among the Catalans. We certainly had little understanding of the situation or very much understanding of the history of Spain much beyond the discovery of America and the Spanish Armada. However, having lived here and being extremely interested in the history and geography, I've come to realise the rich and complex tapestry of Catalonia and its relationship with Spain. The simple history of Spain, which is most frequently presented by Spanish nationalists, sees Catalonia as a region that becomes part of Aragon before, in 1479, being unified with Castille under the Catholic monarchs Ferdinand and Isabella to create the modern Spanish nation. In this view Spain is an indivisible whole and Catalonia was never a country, and so has no legitimate claim for independence. The current claims are 19th century romanticism and a desire to pay less taxes. To get beyond this, and really into the deep emotional feeling that lies beneath the independence push needs a more nuanced view of Spanish history, one which sees Spain as part of a unified crown, but still being a set of semi-independent territories, each with their own governance, laws, taxes and duties. The Aragonese were not allowed to trade in the Castillan West Indies for instance until the mid eighteenth century. These element of self-government and self-identity of the semi-independent territories were swept away in a wave of French-style single-nation laws and centralisation (the Nueva Planta decrees) that followed the Spanish conquest of rebellious Catalonia in 1714, and that included banning the use of Catalan in primary education and official documents. Though Spain remained relatively at ease with itself until Napoleon's invasion, reactions to the events of the start of the 18th Century continued to reverberate through Spain in the 19th and 20th centuries as it struggled under revolts, civil wars (plural), loss of overseas territories and a push-me-pull-you of politics that saw regions pull against centre, and various forms of radicalised politics emerge. Into this melee, Catalonia rediscovered itself and developed its own idea of Catalonia as a nation, distinct from Spain. It was finally allowed to use its own language in official work in 1931 (216 years later), only to have this removed by Franco in 1936. So that within living memory are groups of citizens who were not allowed to use Catalan at school, and who were ruled by proxies of the central Spanish government, rather than through their own elected officials. As a result, there are extremely deeply felt opinions that go far back in time with family memories of Spanish crack downs on Catalan separatist views from even the 1900s. While Spanish nationalists will point to the financial crisis as a catalyst, other forces were already at play, seeking the Catalan Statute of Autonomy for instance. Regional identity versus centralism is a topic that bubbles away through Spanish history. We start the story in 719. At this time, Spain had been conquered by the Moors (mainly from Morocco) who had captured the Peninsula as muslim lands. The Moors pushed into France until they were defeated at Poitiers/Tours in 732. The development of modern Spain then starts with the slow reclaiming of Spain by Christian forces. Resistance to Moorish rule grew in the north first, from Asturies in 722 - the first of the Spanish kingdoms to emerge. The second northern kingdom was Navarre/Pamplona from 824. Then in a complex story of kingdoms and rivalries, Asturies expanded across northern Spain eventually leading to the establishment of the Kingdom of Leon (910). Leon then joining with Navarre. From these northern Spanish kingdoms, the Kingdom of Aragon emerged in 1035 and Castile finally became its own kingdom, from a county of Leon, in 1065 providing the foundation for modern Castilian Spain. Meanwhile on the Mediterranean side, the Franks under Charles Martel ('the Hammer') pushed back the Moors, building on the victory at Tour/Poitiers 732. Between 759 to 801 when Barcelona was captured from the Moors, Frankish victories established the counties of the Spanish March (Marca Hispanica) in what is now Catalonia (and a bit beyond), as a buffer realm between France and the muslim Spain. Unlike the northern territories that (self-) declared themselves kingdoms, the lands of the Spanish March remained as counties (ruled by a count) with local rivalries. However, over time, the Count of Barcelona came to dominate across the counties of the Marca Hispanica as a whole, subduing or forging marriage alliances with the other counts. The 'marches' tended to be remote from the main centres of royal power (in Aachen at this time) and the counts had to be self-sufficient and independent minded allowing counts to take liberties with their realms. Wilfred the Hairy, for instance ensured the title of Count of Barcelona was inherited rather than by appointment of the king, and eventually the counties became de facto independent from the central Frankish power. The earliest claim is in 985 when Borrell II failed to get support from the Franks and so curtailed his allegiences. Both the Kingdom of Leon/Castile in the north, and the County of Barcelona (Catalonia) were growing both in prestige, and in size, through the expulsion of the muslim invaders from lands of Valencia and the Taifa of Zaragossa (the story of El Cid comes from this epoch). Between Castile and Catalonia was the Kingdom of Aragon, which had emerged from Navarre in 1035. Through marriage, Aragon became a possession of the Counts of Barcelona in 1137 and the counts switched to take the titles of King of Aragon as their main title. However, despite being unified under the the same monarchy, Catalonia and Aragon continued to exist as separate territories each with their own system of laws and cortes including custom posts, taxes and duties, not as a simple unified state as we might consider today. The Crown of Aragon grew to include Aragon, Catalonia, Majorca and Valencia plus territories in the Mediterranean including Sicily and Sardina and at one point to Athens. Castile and Aragon continued to develop separately, but slowly the ruling families became intertwined by marriage until the ruling crowns of Castile and Aragon united by marriage in 1469, with Isabella becoming queen of Castile in 1474, and Ferdinand (Ferran in Catalan) becoming king of Aragon in 1479. Once again, the two parts of Spain, Castile and Aragon, remained quite separate with distinct royal councils. During the reign of the Catholic Kings, America was discovered, and the final expulsion of the Moors started with the fall of Grenada in 1492 to the Castilians. Both events reflect the complexity of the kingdoms, under a united crown. When the Americas were discovered these were established Castilian territories and Aragonese merchants did not have access, with access almost exclusively through (Castilian) Andalucia (Cadiz and Sevilla). But even before Ferdinand had got to the Spanish throne, Catalonia had already been through a civil war (1462-1472) in the Revolt of the Remences against John II with involvement of the French and loss of Roussillon (for the first time). So by the time of Ferdinand, it was already past it's high point, and with the discovery of America, and eviction of the Moors followed by coastal attacks by the Ottomans navy/pirates, its importance in Spanish affairs diminished. In short order, by wealth and marriage, Spain became the leading European power. Joanna, daughter of Isabella and Ferdinand married Philip the son of the Holy Roman Emperor Maximilian I, and so their son, Charles V, Spain became Emperor with great lands in the Americas, joined with the European holdings of the Holy Roman Empire (that included Netherlands, Belgium, Burgundy, Savoy, Germany and Austria) - the original empire where the sun never sets. At this time, Catalonia, and Barcelona became a gateway to the Spanish European territories, though via the sea across to Genoa (the Spanish Road) as rivalry with France prevented overland access to the Italian, German and Dutch territories. However, it wasn't all plain sailing, discontent with Charles led to a series of revolts in both Castile and Valencia and Majorca of Aragon (Revolta de les Germanies), as local needs were overlooked for issues of the greater empire. Such large territories were also proving expensive and difficult to maintain. Over the next period, the Spanish Empire fell into wars with the Dutch, the British (Spanish Armada) and the French. An empire of such a size was proving unsustainable and expensive. The vast gold and silver wealth from the Americas brought inflation to Spain and Spain defaulted on its debts (1557, 1560, 1569, 1575, 1595), lost the Armada to England. The cost of war and rebeliousness in the Netherlands (the 80 years war) took its toll and Spain's star started to diminish. Meanwhile wars with France over Italian territories of the Holy Roman Empire and involvement with the French Wars of Religion, spread into plain old wars with France, starting with rivalry over Spanish territories in the north of France (1595-1598). The Spanish European empire fell into a complex war with the Thirty Year's War (1618-1648) involving religion, Netherlands, Sweden and central Europe. As the conflict spilled over, Catalonia become something of a piggy-in-the-middle between Spain and France, as the Thirty Year's war developed into a Spanish-French war of 1635-1659, with the French attacking Spanish territories through Italy, and in northern and eastern France. Spain seeking to protect the border with France, put Castilian troops into private houses in Catalonia (which included forcing peasants to provide food for the soldiers). The result was a Catalan Revolt of 1640 - also known as the Guerra dels Segadors - when Catalonia declared itself independent under the protection of France. The song Els Segadors based on this period of history is considered the national anthem for the Catalonia. At the time, Portugal had also revolted against Spain and the Catalans looked towards the recently liberated Dutch for inspiration. This 'Independence' lasted until 1659 when a Spanish-French peace returned Catalonia to the Spanish King, but with the final loss of Rousillon (Catalonia Nord) to the French, and a continuing bitterness towards the French. Tensions didn't diminish though with another revolt (Barretines - named after the traditional Catalan red cap) 1687-1689 which was more of a class war, again partly because of tension between Spanish soldiers and the local population, and the Nine Year's War 1688-97 again between Spain and France. With all this turmoil, by the outbreak of the Spanish War of Succession in 1701, Catalonia was out of sync with the rest of Spain. The war which encompassed half of Europe, was over the choice of the Spanish king from one of the two major European royal houses. The Bourbons from France, supported by most of Spain and the French, or the Hapsburgs of Austria supported by Britain who feared a French-dominated Europe. Catalonia took the side of Britain and supported Charles, the Austrian candidate for Emperor. With the victory of the French Bourbon king, he sought to impose a French-style centralisation on Spain. In the Nueva Planta decrees the historic institutions, governance, tax raising powers of Catalonia were removed and the Catalan language was no longer to be used in official documents. At the same time, the centralised monarchy installed vice-roys to take command of the provinces backed by Spanish troops effectively throwing out hundreds of years of autonomous rule and traditions across the Spanish provinces. Catalonia was not the only Spanish province that felt the rules were unfair, but matters didn't come to ahead until after the Napoleonic invasion had passed (when parts of Catalonia were subsumed into France as a new French department). These underlying tensions in the 19th Century, led to Spain being repeatedly pulled apart through a complex series of revolts and wars, including a civil war from 1833-1839, shifts from monarchy to republic and back again, and internal factionalisation as another royal succession dispute gave rise to Carlists - who were in favour of Infante Carlos V's - Don Carlos's - claim to the throne based on the French derived male succession rule, over Isabella II, his niece who became queen, based on the older Spanish rule that allowed female succession. This seemingly arcane rule created tensions and rebellions right up to the 1930s. And at the same time, Spain, like much of Europe, was developing a complex set of new political ideas including anarchism, as working classes became more powerful. Meanwhile, industrialisation had come to Catalonia, and it began to rediscover its language and heritage (the Renaixença or rebirth) that started to emerge after the liberation of Spain from Napoleon. Through the 1830s to 1860s, this rekindled ideas of Catalonia and Catalan nationalism as Catalans reviewed and romanticised their history and their relationship to Spain. To start with this led to calls for federalism, but later to calls for full independence. This idea of separatism got swept up with the prevailing moods of anarchism and revolt so that by the late 1800s Catalonia had a firm secessionist movement that was being prohibited by the Spanish authorities with suppression including martial law in 1900, and a short lived revolt in 1909. This sense of nation and historical identity from the 19th century is then swept into the troubles of the 20th century. The eventual outcome was the Spanish Civil War and the rise of Franco, but before this there was another period of dictatorship and republicanism leading to Spanish Second Republic of 1931. The chaos of the pre-civil war politics even led to further declarations of Independence, but all was lost with the collapse into war between the Franco nationalists, and the Spanish Republicans. George Orwell's Homage to Catalonia gives a good flavour of complex mix of factionalism and war in Barcelona and Aragon. Franco's victory came with the exili - a max exodus of refugees into France as can be seen on some of the walking routes or the museum at La Junquera, with camps on the French side of the border at Argeles and Elne. And under Franco, Catalan institutions and language were once again suppressed, so that even now there are old people in Catalonia who were not allowed to learn Catalan at school. Franco initially had a policy of self-sufficiency, which drove Spain into the ground. After the Second World War, more liberal policies were adopted and Spain opened up, bring tourism to the Costa Brava and industry back to Barcelona but sold as Spain, not Catalonia, with tradition Spanish totes like bull-fighting and flamenco dresses. However, Catalan pain and pride remained undiminished. From the end of the dictatorship, the Catalan civil societies have been working to reestablish Catalan institutions, language and elements of culture with a view to gaining recognition of Catalonia's status and history. In 2006 Catalonia agreed a new Statute of Autonomy (approved by Catalan referendum and supported by the Spanish government), however this was ruled in part to be unconstitutional in 2010 by the Spanish Constitution Court supported by PP. 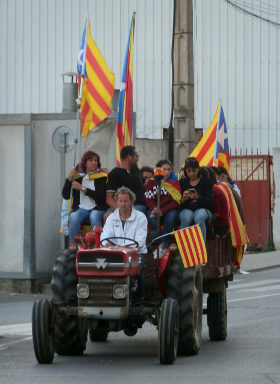 The rejection of the Statute of Autonomy caused many in Catalonia to demand greater autonomy and, combined with the economic crisis, led to a great renewal of independentist feeling with a major grassroots demonstration in 2012 (more than one million people out of a population of 7.5m), that effectively pushed Catalan politicians to become more focused on independence, and was then followed by huge marches and demonstrations in each of the subsequent years. So behind the current political stand-off is a deep sense that Catalonia should be respected for its traditions, history, language and culture which are distinct and not the same as Spain. Among Catalans there is a perception that Spain imposes itself on Catalonia - it is the relationship of a dominant father who demands respect from an errant daughter, instead of being a relationship of kinship, peers and mutuality. This local view sees the unwillingness of the central Spanish government to listen or respond to the Catalan protests, which were met with practical silence and sitting on hands, as further examples of the difficult nature of the relationship. The intransigence and inaction of the Spanish government, combined with deep seated local feelings about Catalan identity has allowed the situation to develop so that now Catalonia believes it has a mandate for independence. How this will play out will strongly depend on how the Spanish-side react and whether it seeks to find compromise. While it's not entirely clear how strongly Catalans want to be separate, or whether they just want to have a more balanced relationship with the rest of SPain, the one thing is clear is that some political movement will be necessary. For visitors, it's also worth pointing out that from the Catalan side this has been entirely peaceful with large marches and demonstrations, but in good spirits with no tolerance of trouble. 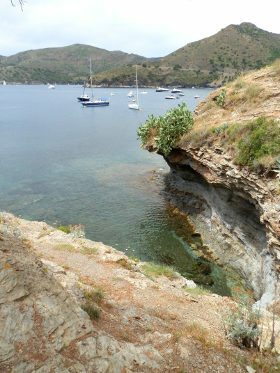 One of the classic longer distance hiking routes for the Costa Brava is around Cap de Creus taking in Roses, Cadaques and then Port de la Selva via the GR92 calling in on hidden bays and over the hills of the Cap de Creus natural park. 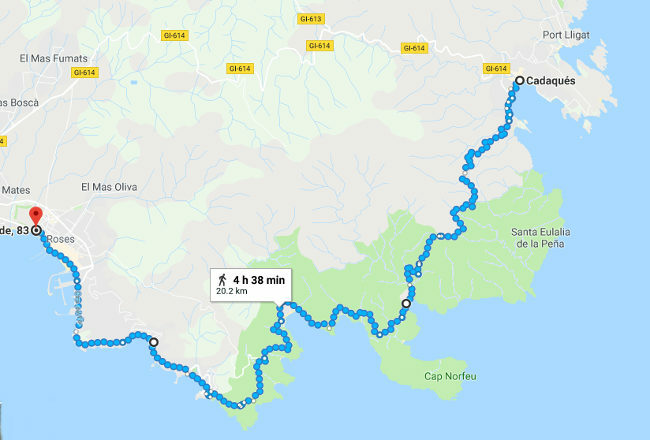 The route from Cadaques to Roses is around 21-23km so too long for a round-trip walk which we tend to prefer, so this was done as a linear walk. For visitors it would be possible to take a boat from Roses to start (or to get back). We walked in July, but luckily on a partially cloudy day, as this is quite a demanding walk with a lot of up and down as the path goes from a beach at sea level, then over the top to the next bay several time. The route is sparsely population, though there are isolated campsites and hotels along the way, so taking a good supply of water is essential - even Zina our dog managed to get through 1.5 litres. The route follows the GR92 (red-white flashes). Along the way there were some occasional smaller paths marked, but trying a couple to get off the wider track, the paths were often overgrown with low sharp gorse, and it was easy to lose the path itself. We also missed one turning for the GR92 on Cap Norfeuga. To start we were dropped off in Cadaques. 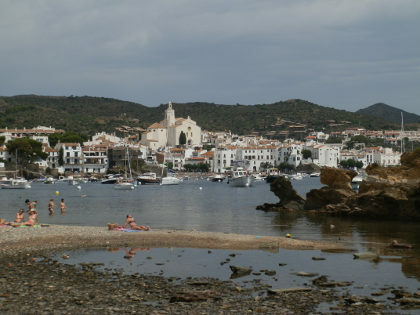 Cadaques itself is relatively isolated but extremely iconic white village at the end of Cap de Creus. To reach it involves a long windy road over the top of the hills from Roses. Despite it's relative isolation, Cadaques is extremely popular with tourists, not just for the village, the bay, the landscape etc but also because it's the site of Dali's house in Port Lligat. For our walk though, we were heading in the opposite direction, heading out of the southern side of the village after reaching the sea and then following the road around the collection of small grit and grey pebble beaches on this side of the main Cadaques bay. Cadaques isn't really a village for a beach holiday, but many sunbathers and swimmers were enjoying the calm water of the morning. As we continued around the bays we slightly deliberately went the wrong way. Instead of following the roadway out we took a short detour along a low headland to an island joined by a small greystone bridge for photographs back towards the town itself. One feature of the walk we discovered is that the geography with relatively harsh rocky headlands and inlets means it's not possible to walk entirely along the coast and in fact the main route out of Cadaques almost immediately heads up into the hills along a dusty track instead of keeping to the coast. The track climbs into the hills and it becomes clear that the dry ravines and rocky terrain make the over the hill route the most practical. The path up climbs for ages, and below us we can see Cadaques and the sea. Up above are one or two white farmhouses in among the scrubby landscape and above them a radar or observation point but little else. Most of the countryside is quite harsh, made up of low knee-high or thigh-high shrubs, gorse and rosemary packed in amongst jagged rock formations. Despite being isolated, we do get overtaken by a couple of mountain bikers and see a few other walkers also following the path. With the climb and the dry heat, even this early in the walk we're talking on water. There are boats out on the sea in the distance and we can just see a lighthouse. One feature of Cap de Creus that always intrigues me is the number of terrace walls and the amount of terracing, much of it overgrown and disused now. Since creating terraces and dry stone walls would have been very hard work, I wonder why the terraces were abandoned. The modern climate seems too dry to make it worthwhile for farming. Perhaps they were grapes that were abandoned in the phyllexora outbreaks at the end of the 19th Century, or olive groves out competed as transport improved, or perhaps the past was just wetter and more fertile than now? Towards the top, we pass another farmhouse, well-renovated with grand views situated by a small stream that surprisingly enough had a small amount of water, enough for Zina to quench her thirst, and the walk levels out across the top. 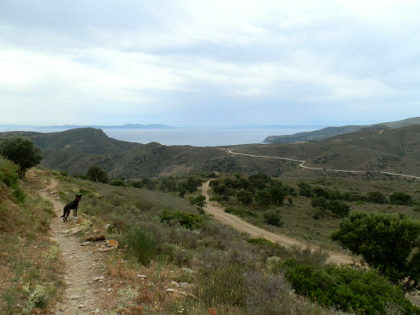 After a while the track turns around the hill and we lose sight of Cadaques and catch our first glimpse of the bays and hills on the other side of the cape. There are roads and the odd car in the distance, but our path leaves the dusty track and takes a smaller path, hugging a hill-line down to a distant bay beneath us. The path is well walked and looks like it has been laid with supporting stones on the side. The bay ahead of us is Cala Joncols and we can see yachts in the water under the cliffs. A steady stroll down the hill and we arrive at a house and then down to a small nest of houses on the bay itself. There are cars too and a car park that is reasonably full, particularly given the only access is by a gravel-track road. The beach is broad and has people and another small river with water. At the back is a hotel, and a tourist boat is pulled up to a platform just off the beach. The sign post points to steps and track up from the far side of the beach, and we head up again into the shrub. For some reason we miss the path and get a little lost in amongst the gorse and just try to head up to see if we can see a way out. At the top we can see a couple of other hikers picnicking and that helps us get back to the path. At this point we're cross the peninsula of Cap Norfeu, and from the top we can see the bay behind us and the coming bays on the way to Roses. For anyone with a boat, this seems to be the place to come and there are plenty of yachts and boats moored in each bay. On the other side we walk to another signpost, and see a few more cars. The signpost says the GR92 goes along the peninsular a little way before swinging back around, but we find that this way around we can't find the path down that was marked. It looks as the only paths are heading up to the small tower on the top of Norfeu. It's only when we look back from the other side of the bay we can see how the path runs along the side of the headland and we just had to trust that the path would turn back. Instead we walk down the fence to join the GR92 a little further along and then along the low cliff tops above the sea to the small bay at Pelosa where an open air restaurant is heaving with people and scattered families are playing on the beach. From here we follow the path around the bay-tops before having to join the road to be able to reach Cala Montjoi. We're passed by a few cars on the road and they throw up clouds of grey dust, so it's a relief to find steps down to the Cala. Cala Montjoi itself is famous, though you might not have heard of it. It's the location of El Bulli, the world famous 3-star restaurant run by Ferran Adria, proclaimed the best in the world until it closed in 2011. Now they are transforming the restaurant into El Bulli Foundation reworking all the buildings. However, the bay and beach themselves are very pleasant - with a broad sandy beach, open and natural with a campsite in the back. From Montjoi, the path climbs up over the top of the next set of cliffs - higher this time with views back to Norfeu. 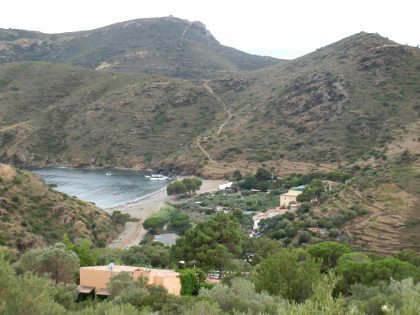 By now we're getting a little tired, but there is a constant up and down as we go up and down for the next couple of bays to Cala Murtra, the last of the swimming type beaches before Punta Falconera, and a naturist beach from the last time we walked this way. From here we climb again to the top and the path runs on top of the cliffs (not too close to the edge). Punta Falconera has old gun emplacements built into the ground that look out towards the Bay of Roses and across to the Isles Medes and Montgri on the far side of the bay. On a clear day you can see for miles down the Costa Brava, or looking back to the hills and mountains in the distance behind Roses. We're now on a route we know and we head back towards Roses and reach the first built up areas for the bay of Platja Almadrava, full of sunbathers and holiday makers enjoying the sand or the bars and restaurants. We carry on following the man-made path around the bays to be met at Platja Canyelles, before a further walk in and on past Roses town to find the car. 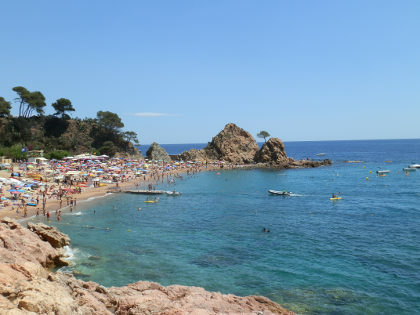 Tossa de Mar is one of the main package holiday locations on the Costa Brava for northern Europeans with a large selection of hotels, restaurants and bars, but will a much more genteel ambience compared to the party town of Lloret de Mar down the coast. Tossa de Mar has three beaches in the town itself - Mar Menuda at the far end near the rocks and island, the main beach Platja Gran, and Platja de Colodar which sits just under the old town walls. Mar Menuda is rockier, it is the best area for snorkelling, but also attracts large numbers of divers, and people learning to dive. 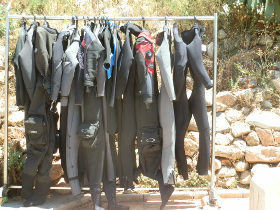 When we were there at the end of June we saw lots of groups of 10-12 shuffling down to the beach in wet-suits, and then had the entertainment of swimming over the top of them as they inspected the nooks and crannies at the sea floor. 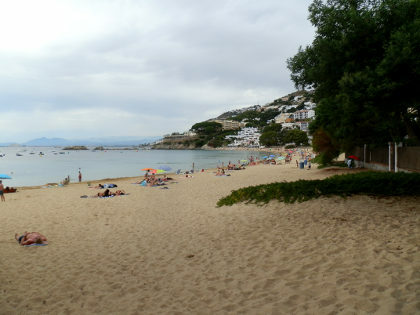 Platja Gran is the main sun-bathing beach and gets quite full in the main season. The sand is gritty and similar to that of Lloret or Platja d'Aro main beach, and were it not for the location with Tossa de Mar behind you and views to the town-walls/castle to the right, it wouldn't be that special. The bay shelves quite quickly, and there are channels on the beach reserved for pedalo/canoes and for the Dofijet boats that take visitors up and down the coast down as far as Blanes. 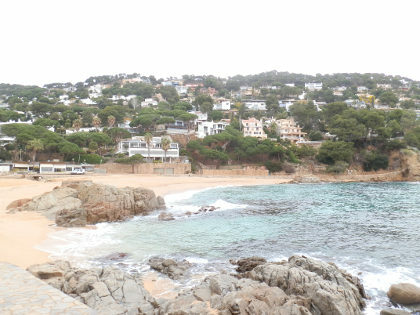 Platja Codolar, is the smallest of the beaches and is tucked away under the town walls. It's narrower than the other beaches with more rocks and often good clear water full of irredescent small fish. If the wind is in the wrong direction though, it can attract flotsam that you have to swim through. The beaches have all the facilities of the active tourist town of Tossa de Mar behind them - including bars and restaurants and chiringuitos. All have lifeguards and the main beaches have areas like toilets. Platja Gran has sunbed hire and pedalo and canoe hire. The sand for all the beaches is fairly gritty rather than sandy and in some places more like pea-stones, so it's not super soft for sand castles or under foot, but it's fine for walking barefoot, so long as it's not too hot. 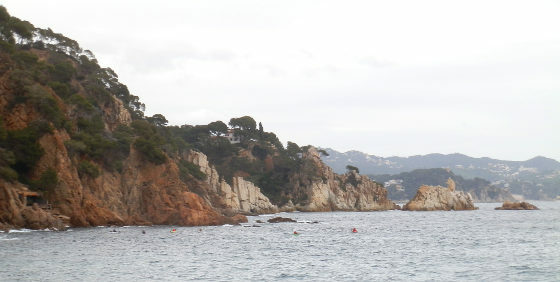 Platja Colodar has rockier areas around what is a relatively small sandy area. Mar Menuda is probably the most fun area for swimming as there are more rocks and more fish and it's possible to swim around the headland or island if the sea is calm. Certainly when we were there, we really enjoyed swimming over the top of the scuba divers, though on busy days this can make the water quite crowded. 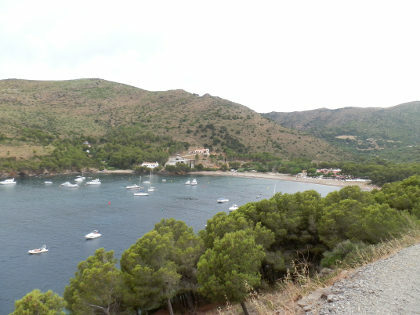 From Mar Menuda, a longer swim takes you across to Platja Gran and then across the bay. 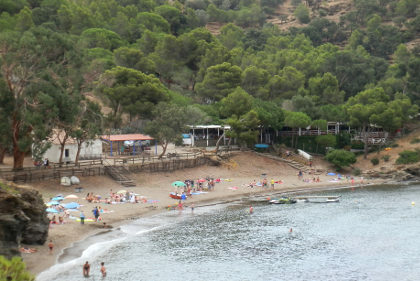 The main bay is sandy and the boat channels (for the diving boats on Mar Menuda, and for the pedalos and Dofijet on the main beach), curtail longer swims. The main Platja Gran beach shelves quite quickly to a sandy featureless bottom. Under the town walls is rockier, but didn't have that much sea-life for snorkelling when we swam. Platja Codolar is rockier and clearer and definitely has more fish, with the ability to scramble over the rocks if you like diving or jumping in. Tossa de Mar has paid-for town-parking. We tend to park a little out from the centre in quieter areas and then walk in. At the back of the beaches and into the town itself are a wide selection of restaurants, bars and hotels. 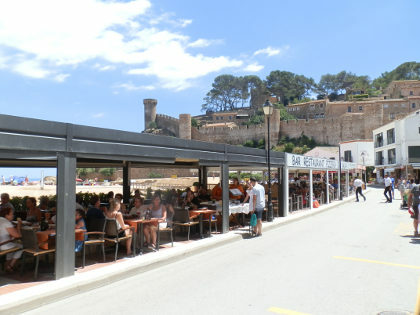 Tossa de Mar has a selection ranging from Michelin starred to everyday beach bars. Though Tossa is a very popular holiday destination, it is quite genteel in style, and very different from the brash party town of Lloret further down the coast. For somewhere a little quieter Cala Pola is to the north or Cala Llevandou to the south are 40-50 minutes walk away, or further still to Platja Canyelles midway to Lloret. Tossa de Mar is on the GR92 and we have included walks to Cala Pola. The stretch from Tossa to Sant Feliu de Guixols is possible by GR92, but would be too long for a round-trip walk. 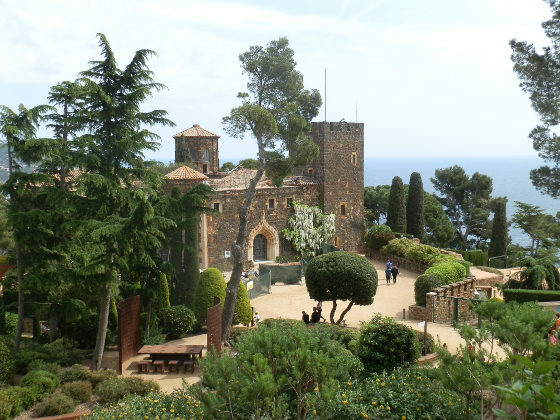 Spring is in the air, and with flowers coming into bloom and a rush of budding plants turning the Costa Brava green, it seemed a good time to visit the botanic gardens at Cap Roig, a castle built in the 1920s and 30s that sits above the sea, just on the outskirts of Calella de Palafrugell. Cap Roig itself is one of the earliest influences of overseas visitors on the Costa Brava. 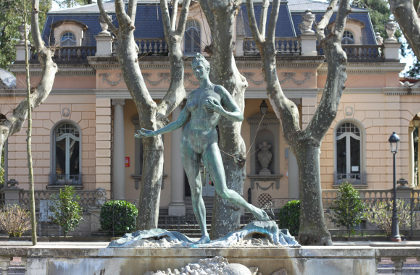 The house and gardens were formally owned by an English aristocrat Dorothy Webster and her Russian husband Colonel Woevodsky who fell in love with the area around Palafrugell built the castle and instigated the gardens. 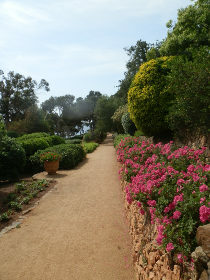 Now, the house and gardens are owned by a La Caixa foundation (if you bank with La Caixa entrance is free) and are maintained as botanic gardens overlooking the Mediterranean sea with beautiful views in addition to the plants. It is also the location of the Cap Roig music festival that runs through the summer with musicians of the quality of Tom Jones, Lady Gaga and Sting in recent years. 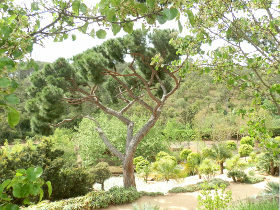 The gardens are spread over 17 hectares (about 60 acres) across the slopes below the house towards the sea. From the main entrance by the car park, you enter into a small nest of buildings, then walk along extremely well manicured paths around the the main castle. The castle part was undergoing some renovation, but I don't believe that part itself is open. Just below the house/castle is the festival area which is closed off. 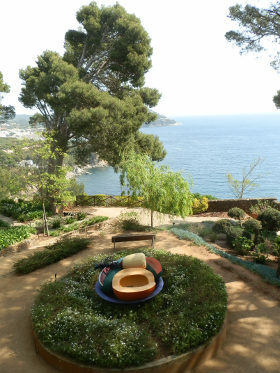 The gardens closest to the house are laid out as formal terraces with names like the Nuns' Terrace or Lovers' Garden, giving views across to Calella de Palafrugell and Llafranc. These areas have clipped trees and statues in among the formal specimen plants and seem specially designed to emphasize the views and vistas. Below the terraces more towards the sea and the red headland of Cap Roig itself (Roig meaning red in Catalan) are firstly flower terraces and then further down towards the sea a set of cactus gardens. Back up above the house are then the Mediterranean gardens drawing on the local plants many of which can also be seen wild in the woods that surround the estate via the many footpaths that take walkers down towards Platja de Castell and the fields of Mont-ras. Further out, back towards the entrance are more palms and laid paths using the natural slope of the hillside. What looked like a new childrens area was also found in this part, set close to orange groves in among the various types of palms. For gardeners, the plants are all labelled and extremely well looked after. For the rest of us, this is an idyllic location just to enjoy the view and colours of spring. If it's a choice between shopping or walking, mostly I prefer walking. So to give the family time to go clothes shopping around the boutiques and chain stores of Platja d'Aro, I got them to drop me off at Romanya de la Selva with a plan to walk to meet them. Romanya de la Selva is a small stone-built hamlet at the top of the Gavarres, above Sant Cristina d'Aro with walks to Puig d'Arques, or possibilities to follow a route down through the Gorges de Salenys. 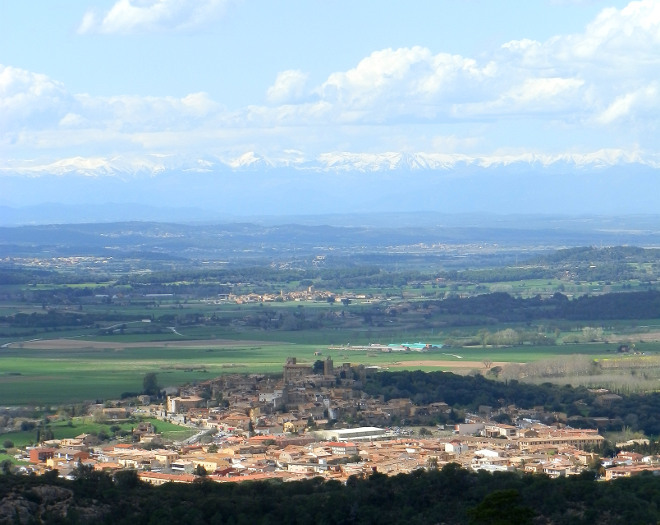 The village has a handful of restaurants with fabulous views out towards the plain of Girona in the distance. We've walked this way before to Puig d'En Ponç through the woods. This time though we walked along the ridgeback of the main hill. If you're driving the dual carriageway from Llagostera to Sant Feliu - the main access road from the autoroute - this is the hill to your left as you drive down the valley to the sea. As mentioned, there are options on the route to take paths through the woods, but we stayed on the road which is quiet and not heavily used. 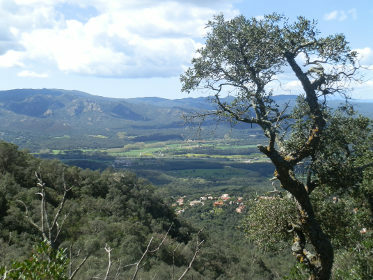 The road is initially in the woods which masks the view a little, leaving only snatches of vistas in four directions - out towards Massanet behind us, down to the valley of the Aro below right, across the Gavarres to the left, or the views to the sea and out towards Palamos and the bay at Sant Antoni ahead. We did try the path up to Puig d'En Ponç again, which took us to a great spot, with a triangulation point, but as mentioned before, because the trees were so high meant we couldn't actually see out (it would be a great spot for a small viewpoint tower). After Puig Ponc, we came across the first fences marking the very posh golf club of Mas Nou. It's always a pity where a golf club seals off the countryside with fences to stop walkers, but the road passes right through the middle, so we didn't lose the views and instead we could observe the golfers in their trolleys and the manicured fairways and bunkers with views to the sea. 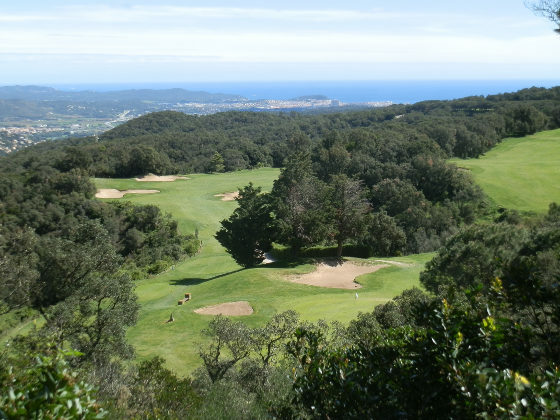 Golf is extremely popular on the Costa Brava with at least six golf courses nearby including a PGA championship course at Caldes de Malavella, and three courses near Pals. Golf d'Aro at Mas Nou, with it's position on the crest of the hill and views towards the coast seemed somewhat exceptions and might explain the handful of expensive cars that passed us on their way to the greens. Certainly the lush fairways and ponds for water make for a pleasant walk even though it's on the other side of a fence. At the far end of the golf club is Hapimag resort - a large upmarket hotel complex and golf resort with views over the Aro valley and obviously connections direct to the golf (from the dual carriageway below as you drive past Sant Cristina d'Aro you can see the buildings looking like a medieval village above the valley). Beyond Hapimag the road enters the Mas Nou estate residential area. It has a barrier (which was open), but the road seemed open and there were no private keep out signs. 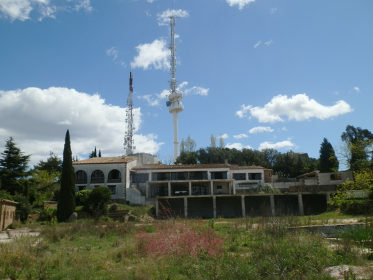 The estate is well-to-do, in keeping with the golf course, but as you reach the two radio masts underneath is the shell of an abandoned restaurant and estate club area with an empty swimming pool, weeds growing through the children's play area and grass poking through the tarmac of the tennis courts. Given the aparent wealth of the area, it's a suprise to see something in such disrepair. But it is quite common. Older estates were built at a time when buyers wanted communal facilities like pools (rather than have their own pool) and sports and other leisure activities and so developers added them to the urbanisations that popped up across the Costa Brava in the 1970s and 80s. However, when the estates were finished and the houses were sold, the developers had no interest in maintaining the complexes, and the house owners decided not to pay the fees, or didn't visit enough to make the facilities worthwhile. The result is that many older estates have these disused and abandoned estate centres, despite the fact that the houses themselves around are well used and well cared for. And so on past the radio masts, after taking the view from the Mirador road, and it's time to go down to Platja d'Aro. The views to Palamos and out to S'Agaro are great but we're still on the road and it is remarkably steep (17% or 1 in 6) almost forcing us to jog down, so it's good we weren't coming up. The road comes down just behind the Aiguabrava water park at Platja d'Aro past the church of at Fenals d'Aro and a set of older houses of what would have been the original village. Prior to the 1950s the area was known as Fenals d'Aro, changing to become better known as Platja d'Aro (beach of the Aro, or as is occasionally still seen in Castilian Spanish Playa d'Aro) as the area opened up to tourism. And so back into town and off to find the shoppers. 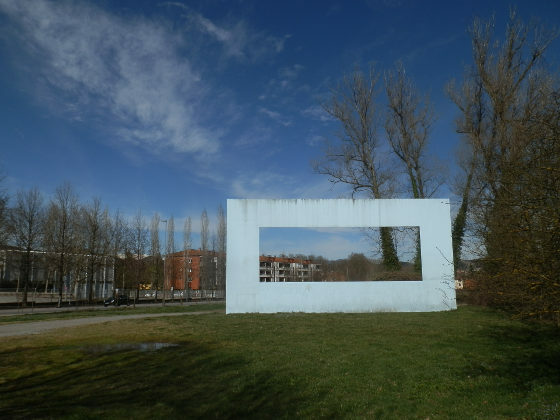 Heading towards the mountains from the coast past Banyoles and then Besalu, the first major town is that of Olot located on a plain surrounded by extinct volcanoes and home of the recent winners of the Pritzer Architecture prize, so a place recently in the international press. We've passed by many times on the way to Vall d'En Bas, Rupit or Campodron but as is normal with Catalan towns and villages, it is very easy to drive past on the way to somewhere else without actually seeing anything of the town itself. So to make up, we took a day walking in and around the town to try to get to know it better. The first thing to note is that the Garrotxa is a rich and fertile area, so it's quite green and verdent. We were visiting at the end of Spring and in the background behind the volcanic hills, we kept catching glimpses of the snow on the Pyrenees in the near distance. We parked nearish to the centre, but were immediately struck by the hills and the temptation to head high to get a panorama was too tempting, so rather than head straight to the centre, we took a footpath up towards the remarkable church tower of Sant Pere Martir which stands on Montolivet in among an estate of houses with an enormous sculpture of a head embedded on the tower looking down at the town. 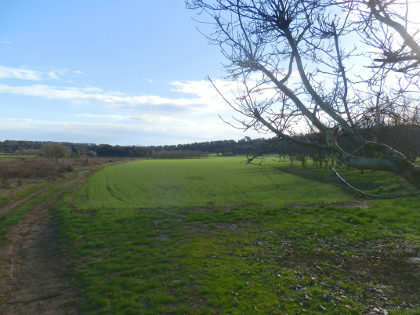 We hoped to be able to follow a walk from the church around the woods and so to follow the outskirts of the town, but after tracking a few footpaths, we decided the only route was to head in towards town. 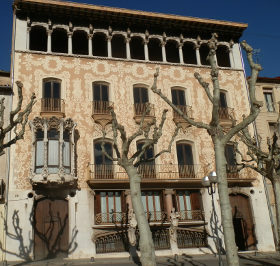 But wanting to leave the town centre to last, we turned out towards Vall d'En Bas and were amazed to see what looked like French architecture at Placa Manuel Malagrida. 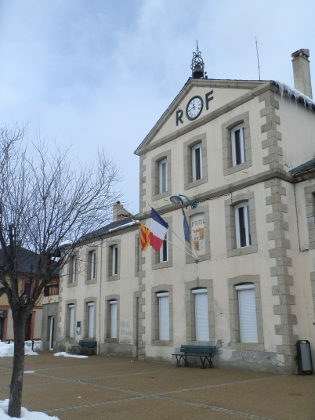 Now obviously Catalonia neighbours on France and, at various points in its history was assimilated into France in one way or another, but in general there are relatively few buildings in a grand French style. Our next surprise was that behind the pavillion the streets led into an area of 1920 villas arranged as part of a garden city. 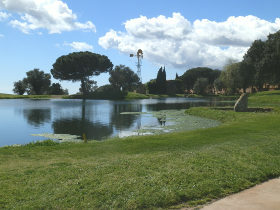 The estate is laid out like two spoked wheels with vistas and ramblas along the diagonals and one long passeo that joins the middles and heads out to the park (Parc Nou) and the Museu dels Volcans. 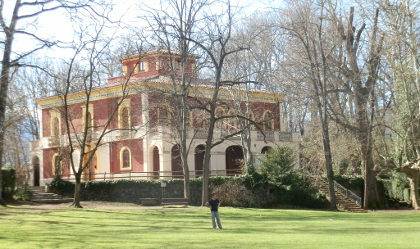 The museum is in one of the villas (Torre Castanys) in the centre of the Parc's landscaped gardens. We didn't visit the museum itself, but just looked around the park. From here we followed our nose on the outskirts. 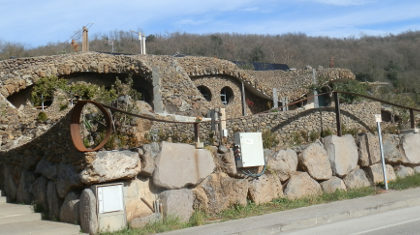 We were actually looking for an unusual 'hobbit' style house that was being built on the road towards Santa Pau, and to see if we could see any of the architecture which won the prize. Our route was a little haphazard as we passed the main bypass road and a large blue sculpture like a picture frame, and then across the fields towards the area of Sant Cristofol de les Fonts, past a memorial to Francoists shot during the early part of the Spanish Civil War. The hobbit house was in development and looked to be private, but consisted of a very organic piece of architecture of curves like a rabbit warren. When it is finished, it's quite possible it won't be as easy to see from the road, and there was no way of visiting to see more. From the house we could look back to the city and see the snowy mountains behind the town. But we decided that it was time to head back to the centre to see what Olot really has to offer in the centre. 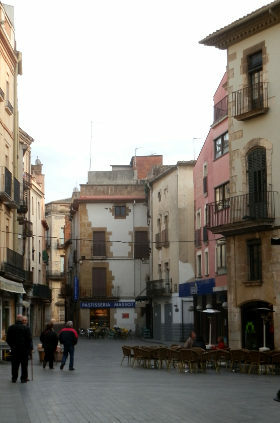 The town itself is a traditional mix of squares and old high narrow terrace streets of shops. Being a Sunday it was quiet as the shops were closed, but the amount of commerce suggests that it gets busy when everything is open. By the main church a wide rambla heads away from the centre and on the rambla is a delightful modernista house. Continuing on, we pass the slightly daunting very modern architecture rust-steel covered building of Sala El Torin. 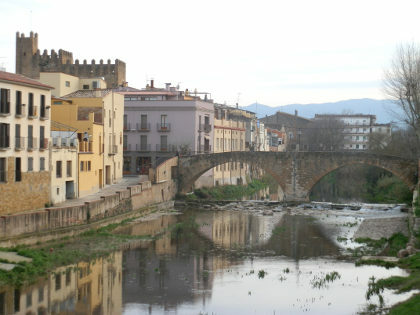 Spring rains on the Costa Brava have come, and what are often dry riverbeds now have water, the most noteworthy being the River Daro at La Bisbal d'Emporda where its old stone footbridge into the old town has a chance to show its purpose. 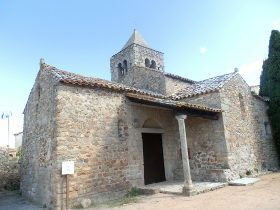 The villages around La Bisbal d'Emporda are some of the gems of Costa Brava, small stone-built medieval villages of narrow streets, cobblestones and vaulted central squares like Monells, Peratallada, Corca, Mandremany, Vulpellac, and Fonteta. La Bisbal itself is often overlooked. For tourists, it is easy to take the main road through La Bisbal or to take the ring-road around outside and to see it as just a line of pottery and ceramics shops on the way to the coast. 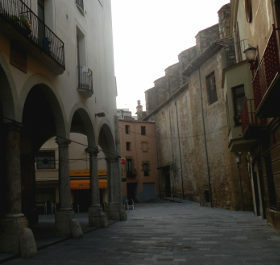 But, in fact, the central older town of La Bisbal, that is not visible by car has a lot of charm and history. 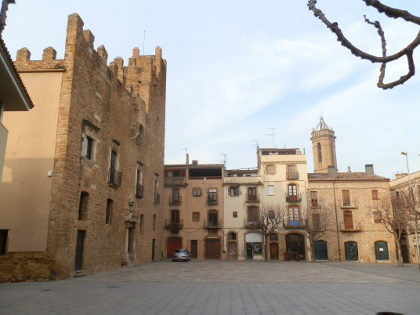 Being the main town for Baix Emporda and a seat of the Bishop of Girona, it hides a classic continental market town with squares and passageways and its own original Jewish Call. 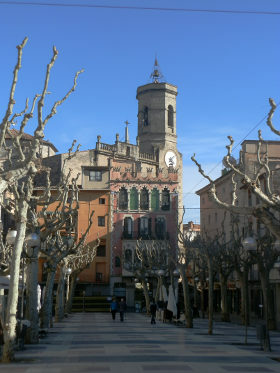 The name La Bisbal means "the bishop" and comes about because the town was ceded to the Bishops of Girona from the 11th Century. La Bisbal and the surrounding villages were important both religiously and politically, with the neighbouring Baronia de Cruïlles being one of the important controlling families in the area, with their influence eventually taking in Peratallada and out to Begur and Esclanya, and with some family members becoming bishop of La Bisbal. The history of medieval Catalonia is a little confusing, because unlike the burgeoning kingdoms in the north of Spain, that eventually became the kingdoms of Asturias, Leon, and then Castille, in Catalonia there were continuing tensions between the counts and ruling families. Overtime the Counts of Barcelona established primacy over the other counts of Catalonia, including the counts of Empuries who somewhat confusingly alternated in name between Hugh and Ponç. 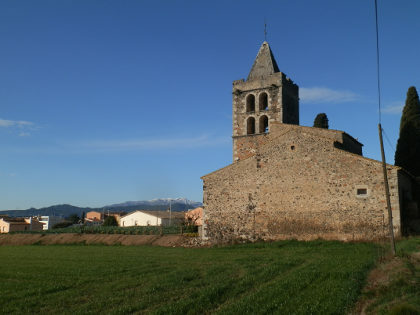 But at the same time, the Bishops of Girona sought influence over the Basilica in Castello d'Empuries (Catalan wikipedia link gives more details). The struggles between the various Counts in Catalonia seems to be one reason Catalonia as a territory never became a kingdom with regular power struggles sometimes leading to full on conflict (eg Aragonese Crusade or the Catalan Civil War in the 15th century) often with the help of the French. Over the centuries, the Emporda region has seen regular flow of Spanish-French conflicts and intrigues, the last being during the Napoleonic Penisular Wars when La Bisbal was the site of a battle when the very Spanish sounding Henry O'Donnell took La Bisbal from the French (the Imperial army was commanded by the very French sounding Jacques MacDonald). As an indirect link, the Hotel at Castell d'Emporda has what they say is the largest scale model of the Battle of Waterloo, for those interested in Napoleon's time. 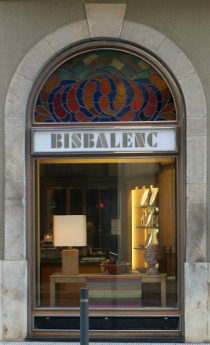 More recently La Bisbal is best known for its ceramics and terracotta - hence the shops along the main road and the presence of the chimneys through the town. The town has both a terracotta museum and a school for ceramics for what became the most important industry for the town. In current times, except for market day when the streets throng with local people, La Bisbal can feel quite quiet, undiscovered and undisturbed but there are lots of nooks and crannies to explore. 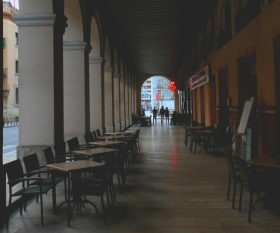 If there were a few more cafe terraces it would be perfect as a place to sit and enjoy the history. What a great blog. I am planning a walking holiday in the region and wonder if you can recommend the best walking maps, like UK ordnance survey ones. I shall be reading more of your walks over the coming days as we plan. Sorry I missed the comment, so I hope it's not too late - use the contact box if you'd like to send a message. For the coast, the GR92 is best and if you have driver you can just take it piece by piece. 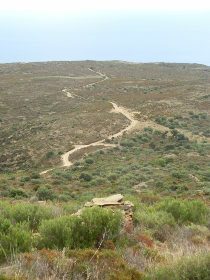 For hikers, around Cap de Creus is great, though it can be dry and hard walking in summer. 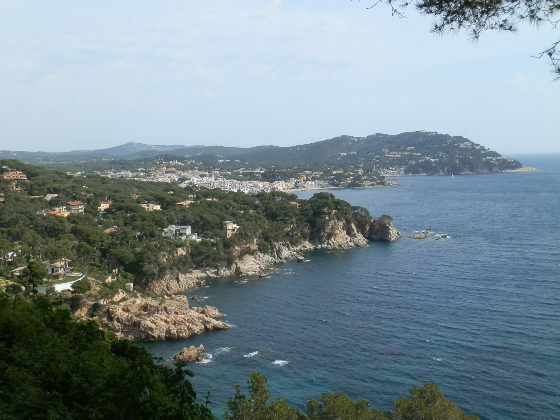 For us, the stretch between Palamos and Palafrugell and on to Begur is the prettiest part of the whole Costa Brava and really good for walking. I'd probably also take the walk up and over Montgri, possibly starting at Pals, or L'Estartit to L'Escala. And though you said you prefer the coast, don't overlook inland routes as there are some wonderful villages and countryside out towards Girona, La Bisbal, or Olot. My name is Sven Furmark. I am from Sweden. I plan to go to Costa Brava with some friends (totally about 10 people) for hiking for one week (5 walking days). We are experienced hikers and we usually walk 4-6 hours per day. We prefer to walk along the coast as much as possible. We plan to rent a house and travel to each days hiking with a bus & driver which we plan to book for the whole week. Which five hikes would you recommend for us.